Canfield High School is known for having many different sports that have very talented athletes. These athletes though do not just participate in one program, many are very gifted students who are known for participating in more than one sport and taking on the challenge of balancing their sports and their academics. One of those athletes is sophomore, Madison Peckman. Madison participates in JV football cheerleading and the swim and dive team. 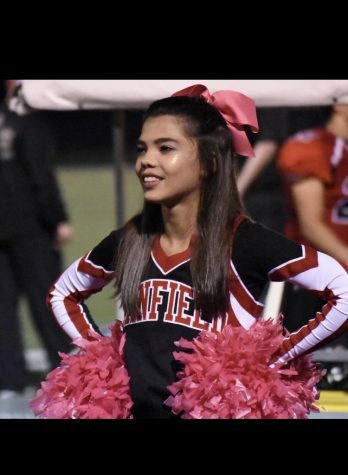 She has been cheering since she was on the Canfield Little Cardinals, swimming since she was four years old, but this is the first year that she has had to balance cheerleading, swim, and academics all in one. She said that flying is her favorite part about the Friday night games. When Madison is not cheering for Friday night football games, she becomes a member of the Canfield Swim and Dive team. Being a member of the team she has been able to learn how to manage school work, and a four hour practice every Monday through Friday. She believes that with these three words, that is how she can keep everything in order for herself and manage school and sports.